Pierre Teilhard de Chardin stands apart, along with Karl Rahner, Henri de Lubac, and Hans Urs von Bathlasar, as one of the most influential Catholic theologians of the 20th century. Teilhard’s overall theological program sought to reconcile the central features of traditional Catholic faith with the insights of such pursuits as reason and biology. Here we examine Teilhard’s insights from The Divine Milieu, his reflections on the centrality of the interior life of faith. While The Divine Milieu is not his best known work, that being The Phenomenon of Man in which he discusses the relationship between evolutionary biology and Catholic faith, this work nevertheless offers numerous insights into Teilhard’s emphasis on the universality and interior nature of Christian faith. Written specifically for Christians wavering in their faith as a result of such non-theological advances as evolutionary, Teilhard demonstrates what he understands to be the central defining feature of Christian faith, namely that traditional Christianity can be translated into the modern context of the Catholic Church (11). 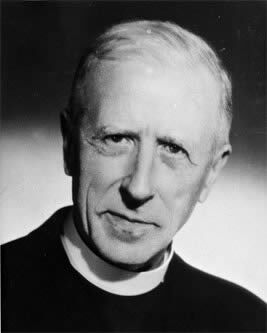 Teilhard de Chardin readily admits that the immensity of the world, its ideas, competing religions, and the plethora of persons, can easily overwhelm the thinking of individuals when thinking about the central truths of Christianity, that is, the importance of the Christ of the Gospels (14). Writing that “What is most divine in God is that, in an absolute sense, we are nothing apart from Him” (17), Teilhard argues that an examination of human religious experience remains fundamentally important to finding God in the modern context of the Church. In attempting to tangibly demonstrate that fears concerning ideas that no longer appear to coincide with the “Christian religious ideal” are unfounded concerns, Teilhard offers an encompassing review of internal and external religious experiencing. Before examining his perspective on external and internal experience, it remains worth noting the two central arguments included within Teilhard’s writing, namely that traditional expressions of Christianity, such as Baptism, the Cross, and the Eucharist, may be adapted to contemporary circumstances and that the whole world is indeed full of God and thus can rightly be called the “divine milieu” (11, 16). In examining the sphere of “external divinization,” Teilhard notes the importance of external obedience and growth in relation to God (17ff). Here he argues that claiming human actions have no value apart from their driving intentions remains an incomplete solution to the question of ethics. While agreeing that much value persists in exalting the initial role of intention (which he writes points toward the Divine presence), such an understanding falls short of a complete answer by failing to “confer the hope of the resurrection” upon those involved (23). To find an answer to the question of ethics, Teilhard argues that all endeavors must cooperate to complete the world in Christ (25). From such a cooperative understanding, The Divine Milieu argues for the necessity of “communion through action,” that is, that all human works impact the spiritual world and human relationship before the “mystical totality” of God (31). The Christian, and indeed human, endeavor then is one of seeking ultimate perfection in God (33). Turning to the internal or “passive” aspects of religious experience, Teilhard argues that proper passivity involves accepting and allowing God’s natural working (47). This passivity ultimately leads to an individual diminishment before God and acceptance of oneself. Humanity itself struggles against evil with God while simultaneously working towards an eventual transfiguration (58). The perspective is such that, “Not everything is immediately good to those who seek God; but everything is capable of becoming good” (58). For Teilhard both the external and internal (passive) portions of human religious experience are necessary components of Christian effort to develop oneself, follow Christ, and find balance in life (69-70). Central to both components is the Cross, as Teilhard writes that the “same beam of light which Christian spirituality, rightly and fully understood, directs upon the Cross to humiliate it (without veiling it) is reflected on matter so as to spiritualize it” (81). The balance of Teilhard’s program is thus reflected in his affirmation of both internal and external spirituality and his argument calling for the need to look past mere ascetic practice of rejection to find the good within. 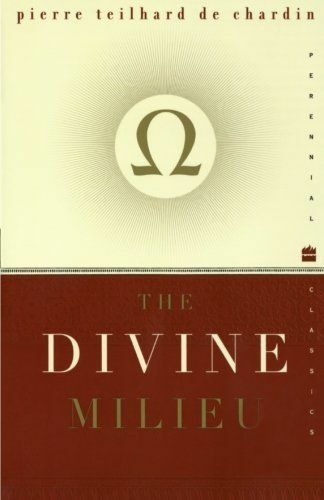 In his section on the Divine Milieu, Teilhard writes that, “All around us, to right and left, in front and behind, above and below, we have only had to go a little beyond the frontier of sensible appearances in order to see the divine welling up and showing through” (89). Ultimately, all of creation exists as a means by which the Divine assails, penetrates, and moulds human beings. God reveals Himself throughout created order as a “universal milieu” because He ultimately exists as the point at which all realities converge (91). Just as Jesus Christ was the point at which the Divine and human were clearly connected, so too the Cross and the sacraments demonstrate the connectedness of the Divine to the world throughout all of the time and space of the milieu (102). Ultimately, Teilhard argues that the history of God’s Kingdom is the history of reunion between God and man. The totality of this feature, the divine milieu of existence, Teilhard argues, has been formed by the incorporation of all the elect in Jesus Christ (128). And it is because of this all-encompassing divine milieu that Teilhard argues that traditional Christian faith can be translated into the modern context of the Church. Pierre Teilhard de Chardin. The Divine Milieu: An Essay on the Interior Life. Harper and Row Publishers: New York, 1960.